If the financial services industry can’t self-regulate and treat its customers fairly, someone else has to step in for the consumer and ask the Office of Fair Trading to take action. Last year saw Consumer Focus submit its super complaint on Isa transfer times, while Which? announced a couple of weeks ago that we’ll be submitting a super complaint about ‘rip-off’ debit and credit card surcharges. Firms cold-calling consumers by telephone and text to promote consumer credit products, including debt management. Firms taking upfront fees for credit services, often by persuading consumers to give them their banking details, sometimes taking unauthorised deductions. Not many organisations have the power to submit a super complaint and these powers aren’t used lightly. Which?’s surcharge super complaint is our first in four years and the Office of Fair Trading has just 90 days to explain how it plans to investigate. I fully welcome Citizens Advice’s intervention in this market. The charity estimates that between 5.5 and 6 million households are either in arrears with bills or credit commitments and are finding it a constant struggle to keep up. Affordable credit is near-impossible to get hold of, leading many to apply for payday loans that charge rates breaking into the thousands of percent. Others turn to credit brokers who put on the hard sell and charge an upfront fee for their services. In too many cases they don’t find you an affordable loan, and don’t refund your payment, leading you further into debt, and even more vulnerable to the clutches of commercial debt management companies. The timing of Citizens Advice super complaint is especially poignant at this time when its own funding is severely squeezed. Organisations such as Citizens Advice, the Consumer Credit Counselling Service and National Debtline are needed more than ever at the moment, dealing as they do with consumer problems at the coalface. There’s some evidence that local councils are starting to recognise the true value of free advice services. For example, amidst budget cuts of some £42bn, Brent Council this week voted to reinstate funding for the local Citizens Advice Bureau (CAB). Let’s hope other councils, as well as the government, show the same forethought. 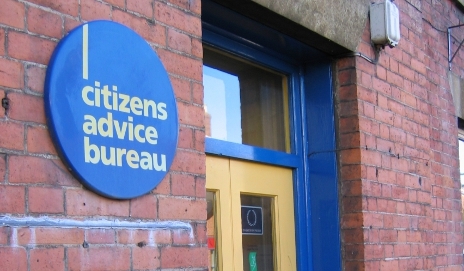 Have you used your local Citizens Advice Bureau? Would you defend it as a vital service, or are you not bothered by its funding getting cut? Yes, Citizens Advice are vital, they provide a service to people who are often desperate for help and feel there is no one else they can turn to. What I really dislike is the way Councils appear to have been keen to make a point by cutting back on vital services blaming “the cuts”, yet have made no transparent attempt to prioritise the cuts they have made. I would like to know how they justify keeping some functions at all (the colloquially known ‘non jobs’), before they start to cut basic services or grants to the likes of CAB who perform vital work, very cheaply. I think the vulnerable are being used as human shields here. It’s an absolute scandal. CAB’s are doing a first class job. Many people who use these could not afford to pay for advice from a solicitor. CAB advisers are volounteers from a wide spectrum and are invaluable. The cost of running this organisation must be very low. I have used CAB in the past and found their advice invaluable. It would be a travesty if this service is withdrawn due to lack of funding. I’ve had mixed reactions to CAB’s. At the one at Rickmansworth Herts they were just plain rude when I sort advice for a neighbour. I now live in Abbots Langley and I used their services once – they were excellent. I work for a bureau. Some of my colleagues have been made redundant owing to reductions in funding streams & there aren’t many paid staff left. Those of us left are scrabbling around trying to get all the work done on shorter hours. The FIF news was good, but we still don’t know how it’s going to work. We still don’t know what council funding we’re getting for next year with less than a month to go. It really doesn’t help with planning. The bureaux provide the evidence that allows CitA to do social policy work such as the super complaint. Thanks for this article and for making people aware of our other equally important role. CAB is vital and councils CAN afford to keep them going if they prioritise right. A key creator of the need for them is the financial services sector, and I think the super complaints are a fantastic effort. I lead a financial services business, and I am routinely inufriated by what the FSA let’s sellers get away with. To me it seems the bigger they are, the more latitude they get. I think corporate governance law needs rewriting. The shareholder should come after the customer in the responsibility chain, not before. in essence, there should be one rule, do to your customer as you would be done by, and if you can’t make a profit doing that, then stop and do something else! Thanks for all your comments so far. The response in the comments above and to me directly has been an overwhelming thumbs up for the work done by Citizens Advice. It’s no secret that I’m not a fan of commercial debt management companies – the work done by organisations including CA, CCCS and National Debtline keeps thousands of struggling consumers out the clutches of companies that will charge for their services. And that’s not to mention all the other advice offered, including on housing and benefits. the more free and unbiased financial advice and protection people get the better, because they gave up so much of their lives to get the money it is scandalous how little power they have over institutions that try to take it away through confusing charges and misleading selling. I think CAB provides vital service in this as in so many other areas, they should be backed to increase, not get cut. I work in a bureau and we are lucky to currently have a very supportive council. We have still had to go through redundancy and we will be looking to lose some staff but less than if the FIF funding had not had a reprieve. On the debt side we are busier than ever and the service that we provide is vital to the local community and it is vital that an element of face to face debt advice is retained. Not everyone has access to computers and not everyone feels comfortable talking to advisers over the phone. In other areas other than debt the funding for legal aid is under threat and we are in danger of losing the resources that allow us to give advice on a range of matters and to give holistic advice. The CAB is absolutely worth fighting for — there are very few places that people can still go and obtain free, independent, impartial, face to face advice and it is awful to consider that councils are creating ‘advice deserts’ where people have no where to go and obtain advice. The CAB must be supported. It is already a effective working example of government’s dream of the ‘Big Society’ because is hugely reliant on unpaid volunteers who want to help others. Along with many other charitable organisations, also reliant on unpaid volunteers, it deserves better support by government – not to suffer funding cuts. It gives free, unbiased advice; it is widely known; and it is open to anyone who is struggling and does not understand their rights and entitlements in our complex society. My sister became an unpaid volunteer with the CAB after she retired from the York housing department. Through the CAB , moreso in the present recession, she finds herself trying to give vital advice to an ever increasing number of people with severe problems caused by redundancy, debt or housing issues. I believe there is a desperate need for more volunteers and therefore for MORE funding for essential overheads such premises, lighting, stationary, etcetera – NOT LESS. I wonder if people realise how much training CAB volunteers have to undergo? A friend who volunteers for CAB says it’s equivalent to studying for an A level. It’s not just a hobby for well-heeled do-gooders with time on their hands. I think it’s shameful that the goverment won’t provide adequate funding to support these dedicated people who are giving so much. Big Society? Put your money where your mouths are, Mr. Cameron and Mr. Osborne!